The Management Committee is delighted to announce that, at a meeting held on 31 October, it appointed Verity Firth to fill the casual vacancy of President, effective till the next AGM. Verity is a longstanding resident of Glebe and member of the Glebe Society. 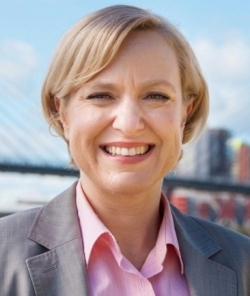 She has previously represented our area as a Councillor and Deputy Lord Mayor of the City of Sydney (2004-2008) and as State Member for Balmain (2007-2011). She was the NSW Minister for Education and Training from 2008 to 2011 and is now the Executive Director of Social Justice at University of Technology Sydney, heading up the newly established UTS Centre for Social Justice and Inclusion. Her children go to Glebe Public School and she is very involved in the school’s P&C and fundraising activities. In this year of our 50th Anniversary, Verity will make an important contribution as President. The Management Committee thanks Verity for her willingness to take on this position and we look forward to working with her. Verity has advised us that she will not be able to stand for the position of President at the 2019 AGM, so the Management Committee will shortly begin working on a succession plan. If you are interested in standing for the position of President or Vice-President at the next AGM, please let us know.